Take a peek into wineries in the area near where the Mediterranean Sea and the Pyranées meet, and you’ll see something strange: row after row of large glass jars filled with wine left to sit in the sun. Haven’t we always heard that heat and light are bad for wine? What are these crazy French winemakers doing? They’re making Rivesaltes, a style of vin doux naturel (a French term for fortified wines) unique to the Roussillon area of France. It’s sweet (but not as candy-sweet as, say, Moscato d’Asti), with aromas and flavors of dried fruits, nuts, and something mysteriously resinous in there as well. It’s a style that most drinkers have to work their way up to. 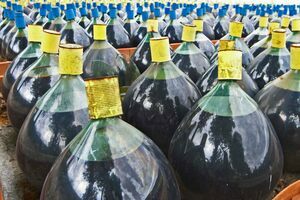 Just as Madeira is heat-damaged on purpose for your enjoyment (although by a different method), this traditional style of wine is aged in glass demijohns to achieve its signature nutty, dried-fruit flavors. It’s fortified with a neutral grape spirit to stop the fermentation, leaving residual sugar that gives the wine its sweetness, and bumping up the alcohol level. Then, it sits in the demijohns for a year, while the elements—rain, temperature swings, etc.—do their worst. The wines are sealed in their containers, of course, but otherwise, nature gets to just go wild. After the wine’s time in glass, it’s transferred to barrels to age for anywhere from one to 50 years to let it take on even more nutty, smoky, raisinlike aromas and flavors. Rivesaltes is made from Grenache, a grape variety that has a few color variations: Grenache Noir, the red Grenache; Grenache Gris, a pinky-gray variation whose skin looks similar to other “in between” grape varieties such as Pinot Gris/Grigio; and Grenache Blanc. Rivesaltes can be made with any of these, plus a small amount of other local grape varieties not to exceed 20 percent of the final blend. And just as you can leave an open bottle of Madeira on your counter for days and have it taste almost exactly the same as it did when you opened it, Rivesaltes is similarly indestructible. By the time it’s finished its aging regimen, it takes on a coppery, tawny color and is very stable after it’s been opened. If this all sounds like a complicated mixture of winemaking styles—a little like Port, a little like Madeira—well, it is. Just as the local culture is not exactly French and not exactly Spanish, but Catalan, Rivesaltes is its own unique wine. It’s also a bit of a dying art, as dessert wines are about as fashionable as stirrup pants these days. So if you can find a bottle, especially an older vintage, don’t miss a chance to sip a bit of bottled history.